Last Wednesday, following my complaint and that of others, the Ombudsman for Environmental and Planning Affairs gave a very clear ruling on the disgusting behaviour of the Planning Authority CEO, Johan Buttigieg, who had authorised the renting of a private aircraft for nearly €9,000 to bring over from Catania a member of the Planning Authority Board, Jacqueline Hili, in order to vote in favour of the DB project. The abuse here is even more pronounced when one considers that on the same day Air Malta flights were available to and from Catania for the paltry sum of less than €200. The Ombudsman also noted that the executive chairman of the Planning Authority must limit himself to recommending and answering questions of the Board and must never take up any other role that could be interpreted as influencing even a single vote in the final decision. Moreover, he added that all members of the PA Board should do their very best to attend meetings and they must inform the Secretary of the Board in due time if they cannot attend or when they have any transport problems. However, members of the Board should be left free and in no way should they succumb to any insistence on the part of the Board for them to attend or not. The Ombudsman, Architect Saliba, informed the general public that the Planning Authority Executive have accepted these recommendations. Fine. So does this mean that the Planning Authority will be now compensating the Pembroke residents for having resorted to this base subterfuge last September? Who is taking responsibility for what happened at the Lyceum hearing? Because, apart from the Jacqueline Gili episode, there are at least two other shady episodes involving two other members of the Planning Authority, who did not declare their direct interest involving their relationship with the DB owners. In fact, the real estate agency Remax, for whom Planning Authority member Matthew Pace works, had been selling on plan the DB Pembroke “property”, a year and a half before the permit itself was actually given. If this is not a classic example of conflict of interest, please do tell me what is. And then we have the case of Labour MP Clayton Bartolo who had held his campaign parties at the Mellieħa property of the DB Group. Had he paid for these services? Or were they a kind donation from the DB Group? Moreover, Bartolo’s father has his own private sea-sports activities company, which operates from a quay in Mellieħa that is the property of the DB Group. Why did the Honorable MP never declare his family business interests which operate from the DB property? Having said this, there are various other examples that prove that the DB Group is just concerned about quick profit and nothing else. The experts have calculated that the excavations for the DB City Project will produce around 350 million tonnes of inert waste. Yet, the DB Group did not state how they would be disposing of all this material. Neither did the Planning Authority take this into consideration when granting the permit. So what is going to happen with these 350 million tonnes? Are they going to end up, together with the over one billion tonnes produced by the Gozo tunnel excavations and the other millions of tonnes produced by Corinthia, as fodder for land reclamation? Where? In Qalet Marku/Baħar iċ-Ċagħaq? In Xgħajra? We don’t know, because everything remains shrouded in mystery. But DB’s concern for Maltese historical and architectural heritage really takes the biscuit. Prior to even being granted a permit, the DB Group had nonchalantly stripped the scheduled ITS building overlooking St George’s Bay of all its windows, doors and other apertures, thus exposing it to all the inclemencies of the weather. In September, the Planning Authority had imposed as a condition that all the apertures be boarded up in conformity with Article 53(1), Chapter 445 of the Laws of Malta. And what has been the response of the DB Group to all this? Nothing at all. For the past four months they have left the building wide open with the result that this historic Maltese building has been totally exposed to the cold winter elements, left to deteriorate and with the risk of internal architectural elements being lost as a consequence of this crass lack of adequate preservation. The Ombudsman has spoken up on this particular issue. 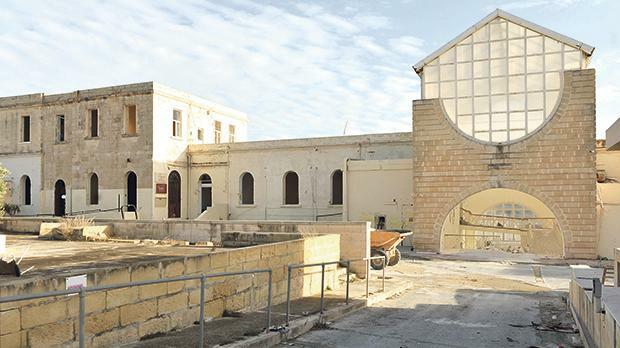 Can other authorities speak up to ensure that public land and historic Maltese property, like the ITS building and the De Redin Tower, are returned to their rightful owners, the Maltese people? Arnold Cassola, Alternattiva Demokratika candidate for MEP elections, is former Secretary General of the European Green Party.